And don't worry about misdirected beams accidentally blistering your retinas, the No! No! 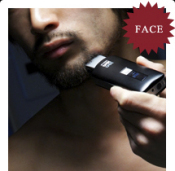 For Men is designed to apply precisely engineered infrared heat rays only to unwanted hair and the follicles beneath. Unless you've got hairy eyeballs, you should be in the clear. Now keep in mind that futuristic technology like this doesn't come cheap, and is there really any doubt that Laser Shaving is the way of the future? Seriously, it ranks right up there with the mysterious Three Seashells from Demolition Man. Well worth the 35,900 yen ($380) sticker price just to impress your primitive pals, hmm? Hey, I wonder if it works on cats? C'mere Fluffy... While not one of the suggested uses, Ya-Man for Men does recommend you use your No! No! For Men to remove hair from your face, body, feet and fingers... yes, fingers. If you're Lon Chaney Jr. and you're looking for that ideal Father's Day gift for LC Sr., step right this way. No! No! For Men comes with a batch of accessories including 2 Buffer Chargers, 5 Worldwide Chips, 2 Small Chips, a Cleaning Brush and a DVD that explains what the accessories are and how to use them. Not bad for a company apparently named for the male counterpart to "You Go Girl!". Originally published June 2010 andl ast updated May 2015. I shave my head every other day- I wonder, would this cut down my need to shave so often? Nothing is permanent, short of actually killing the hair follicle, no matter what those commercials tell you. Even in doctor professional hair removal treatments requirements require repeat trips (at least three) to the doctor as hair grows in cycles and at any one time various hair follicles could be any one phase of the cycle. Yes, even people with full heads of hair are constantly loosing their hair- the only difference being that they regrow theirs, while us balding types have ours replaced by either no hair or by a very fine hair that is blonde and small and nearly invisible.